STOP & SHOP EXPANSION APPROVED --- On Wed, Oct 19, the Planning Board approved a $12 million dollar expansion and renovation of Stop & Shop. A 15,433 square foot expansion will be built on the west side of the building, facing Lodi. As part of the modernization, wood and slate flooring will be lain down throughout the store, 50 skylights added, and the produce, health, beauty care, and floral department expanded. This is all in an effort to win over customers from Shop Rite. It will be an upscale supermarket, “like a Whole Foods”, they said. I challenged them to complete the widening of West Pleasantview Avenue from Summit Ave to the supermarket access road, known unofficially as Pathmark Drive. When Grand Union was built, Grand Union paid to add a westbound lane on West Pleasantview approaching Summit, but that extension stop short of the supermarket access road, causing a severe bottleneck. More than 50% of the westbound traffic on West Pleasantview makes a right turn at Summit or goes straight. When the LEFT TURN lane backs up to the bottleneck point, you reach a point between the apartment buildings where all traffic westbound is in only one lane. This means traffic which intends to go straight or right completely ceases to flow, causing an immediate logjam of cars. This logjam will not budge an inch until the LEFT TURN traffic moves so that the “end” of the logjam passes east of the bottleneck point. Then there is two lanes, and traffic going right or straight can flow again. The timing of the traffic light is also an issue that increases this problem. The applicant’s traffic expert refused, on the record, to acknowledge that this problem would be increased by the store expansion. However they did say that the store currently has very few customers, the parking lot is largely empty, and they want to change all that by modernizing the store. The board debated this problem. Board members Chiusullo and Hurwitz won the debate, saying that people can simply use other exits when the traffic gets problematic. The board denied my request for the board to hire a traffic expert to study this issue, and bill it to the applicant (which can be done). The application was approved. Mayor Townes said that if it becomes a problem, the tenants in the stores will pressure their landlords. Townes says taxpayer money won’t be used to solve the problem. He envisions that all the stores in the area, including Pathmark and Stop & Shop, will someday pool money together to solve this problem. Whether or not this scenario is realistic or pie-in-the-sky is up for debate. Chiusullo said that widening the 50-70 foot stretch of roadway by one lane could cost upwards of $250,000, and he didn’t think that Stop & Shop should foot the bill. OTHER APPROVALS --- The Dunkin Donuts on Hackensack Avenue will be torn down and replaced with a new drive-thru Dunkin Donuts. The long-abandoned house at 363 Essex Street (near Prospect Ave) will be torn down. The stores on the corner will expand into that space, and add a few parking spots. The city recently passed an ordinance banning street parking on the south side of that block. 94 STATE STREET UPDATE --- The hearing for the condos at 94 State Street will continue on Nov 8. As a result of the board's comments in October, they reduced lot coverage from 80% to 58%, increased the number of below grade parking spaces, and added one story to the building. It's still 90 units, but 8 stories instead of 7. This is a handsome and architecturally distinguished building, mostly brick, and unsurpassed by any multi-unit complex in the city, including Prospect Avenue. COL AMERICA REALTY --- The hearing for the proposed new headquarters for Col America Realty (242 River Street) will begin on Nov 9. CITYVIEW CONDOS APPROVED --- On Wed, 11/9/2005, the Hackensack Planning Board approved 90 units at 95 State Street. The project, to be known as Cityview, consists of 3 levels of parking (one is below grade, one at grade, and one above grade), upon which there are to be 6 levels of condos. The peak of the building is at 97 feet. 5 people spoke during public comment, all in favor. The units will probably start in the $400,000’s, all are 2-bedroom luxury units with large floor plans. The lobby has room for a doorman, but it is up to the condo association if they want to hire one. The building will replace a large vacant lot, 2 run-down houses built prior to 1875, a drive-thru Bank of NY facility, and an Aamco transmission business. The property runs the east side of State Street from Warren to Bergen. One of the old houses has an unsightly storefront where Robin Reilly runs a thrift shop. Her operation unofficially doubles as the Faith Foundation, a homeless advocacy operation. Reilly was not present at the hearings, and it is unknown where she will move her operation. Anywhere she goes she will need multiple variances, both for a thrift store to provide homeless services. Executive with the adjacent Carpenter’s labor union (on Bergen Street) testified against people hanging out and causing trouble on the vacant lot. NEW AFFORDABLE HOUSING DISCUSSIONS --- Hackensack and every other city and town in NJ is subject to Round 3 of affordable housing regulations, per the Coalition on Affordable Housing (COAH). The Planning Board discussed how the city would handle the requirements. City Planner Michael Pessolamo said that all housing units built after 1/1/04 generate a 10% affordable housing requirement, and there is no way for any city or town in NJ to circumvent this requirement. Mayor Townes, however, said the city has lately been discussing the impact with various consultants, and this has not been determined. The two options on how developers may contribute are (a) “Build as you go” - require each developer to allocate 10% of the new units as affordable housing in each building as it is built, or (b) “Developer’s Contribution” - require each developer to contribute to a pot of money that can be used to renovate existing deteriorated housing in the city. The latter is much more applicable to Hackensack, and might conceivably include some holdings of Nigito Realty and other deteriorated rental buildings that could be renovated into owner-occupied affordable housing. Cityview said they will contribute, one way or another, towards the city’s affordable housing obligation. They prefer not to have the affordable units onsite. COL AMERICA --- Planning Board hearing is postponed again, the applicant wants to build a handsome two-story office building, with landscaping and lots of parking to the rear, at the NE corner of River Street and Salem Street. A building is under demolition at this time, formerly a mini-blind and window-treatment store. FUJI PHOTO REDEVELOPMENT --- The sprawling Fuji photo factory on South River Street will be closed down, and all 167 workers laid off. This property is at least 5 acres and could be redeveloped for retail or condo use. Some discussions for a condo redevelopment have already happened between city officials and Fuji Photo. 144 FAIRMOUNT AVE --- “Not a snowball’s chance in hell.” That’s the talk around city hall regarding an application very recently filed to demolish a house on an oversized lot at 144 Fairmount Avenue and construct a 3-family dwelling. The zone is R50 (formerly known as R1A). The zone allows single-family houses on 50 x 100 lots or larger. The applicant is Colonelli, a prominent local builder, and their attorney is Michael Napolitan. Although Napolitan is notorious for appearing before the boards and asking for the moon, one would think that Colonelli would be a little more politically astute. The Zoning Board of Adjustment, which is seriously backlogged with cell tower applications and other cases, has to go through the motions of hearing the case. SUNNYSIDE TERRACE, 184 BERDAN PLACE --- Another pending case that doesn’t have a prayer is Sunnyside Terrace. Developers have a proposal to make townhouses on an absurdly gerrymandered lot between Berdan Place and James Street in the Carver Park district. The zoning there is R2, two-family houses only. Most of the proposed units have no street frontage and are proposed to be constructed behind and between the existing houses. The neighbors are up in arms, and they have been attending every hearing, dozens strong with their own attorney to object. The case has been partly heard, and then postponed for at least 8 months due to the case backlog and other issues. The applicant is making the dubious case that the neighborhood itself is totally obsolete and needs to be rebuilt with multi-unit dwellings. This has even further antagonized the community. 436 SUMMIT AVE / SE CORNER OF HAMILTON PLACE--- There’s an application to expand a house so that it will have a 3’10” side yard; this will allow a garage and second floor addition to be built with a driveway accessing Summit Ave. This plan will be altered at the request of the Zoning Board. The applicant, a professional dancer on Broadway, has submitted new plans for the garage which will not impact on the required side yard setback. Her new driveway will be accessed from Hamilton Place. The case is to be completed on February 15th. 588 SUMMIT AVE / BETWEEN EUCLID AVE & ROSS AVE --- The board approved an application for a new homeowner to build an art gallery over his existing rear garage, which is 40 feet setback from the lot line. The art gallery will have a kitchen and bathroom, so technically it's a dwelling unit, and the board had a huge issue with that. He had to concede to deed restrictions that prevent it from ever being occupied as a housing unit. Also approved are his plans to complete a fence along Summit and Euclid Avenue. The fancy brick columns have been up for a year, now he can put the fence between them. This homeowner loves the beauty of Summit Ave, and that’s why he bought the house. He and his wife take great pleasure in investing several hundred thousand dollars to completely upgrade the estate, which was formerly the long-time residence of a professional artist, Mary Ortlip Krieger, who died several years back. She would be pleased, no doubt, to know another artist owns her house now. The zone there is R100, which is the city’s newly created estate zone (20,000 square foot lots at least 100 feet in width). 375 FIRST STREET --- The Zoning Board of Adjustment denied variances requested by the Martin Luther King Jr. Seniors Center to demolish a single-family house and construct a large multi-use complex housing a social hall on the first floor, six low-income apartments for seniors on the second floor, and 12 parking spaces for the entire project. The zone is R2. The non-profit organization is likely to file a Mt. Laurel lawsuit against the city. This would be the first such lawsuit ever filed. BEECH & FIRST STREET PARKING TOWER--- An application is before the Zoning Board to build a parking tower at the SE corner of First and Beech Street, which will occupy almost the entire lot and will encase the existing Giovanni’s restaurant. The Board of Education has sent an attorney, Richard Salkin (former city attorney for 16 years), to object. They don’t want a parking tower next to the high school. The city has determined that a use variance is required. There’s talk of appealing any possible approval to the city council. In 1989, the city passed an ordinance allowing use variances to be appealed to the city council, but it has only been done once. 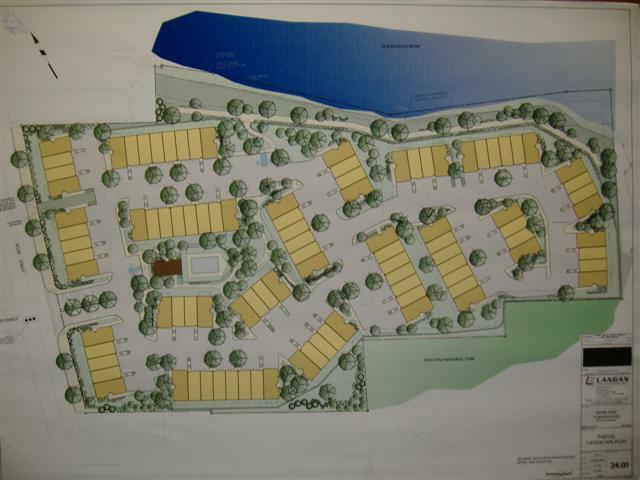 VACATE WATER STREET --- The Planning Board approved a resolution to vacate Water Street from River Street to the river because it is included in the siteplan of an approved townhouse complex. Removal of soil contamination is ongoing on this property, and the PSE&G property to the north. PSE&G is the cause of the contamination, they used to have a coal-fired facility there. Remediation has to be completed before any groundbreaking. It might be a year until groundbreaking. Nappa, which owns land hundreds of feet to the south, is preparing litigation to try and block the project. It’s just a petty feud between Nappa and Trobiano, but it’s going to cost taxpayers big bucks.. Once remediation is complete, PSE&G will likely subdivide their property east of River Street and sell their empty land for retail redevelopment. JOHN STREET & RAILROAD AVE --- In January, the Planning Board approved demolition of an unsightly hundred year-old warehouse to construct a 3-story office building with a bank and a drive through. It’s very near Essex Street. That’s at the NE corner of the intersection, across John Street from Courthouse Auto Body. Previously, a 5-story self-storage tower was approved for the site, but never built. 310-312 ELM AVE --- Stephen Pace seeks approval from the Planning Board to subdivide a lot and build a house almost right on the bank of Coles Brook. There is an existing lawn area there now. This is in the flood zone, and will probably require a Stream Encroachment Permit from the NJDEP. The zoning was changed in June, 2005 to R75, which is 10,000 square foot lots at least 75 feet in width. This was done specifically for stream corridor preservation issues in the vicinity of Fairmount and Elm Avenues. The proposed lot along Coles Brook would be 58 feet wide. Board Chairman Fernando Garip knows the situation regarding the last lot on Fairmount Avenue (the Oliveri application). After an 18 year struggle, the NJDEP did not approve a house due to stream encroachment issues. Only two houses were built instead of three on the extension of Fairmount Ave. It will be interesting to see how this applicant on Elm Ave will make a case that his lot, only a block away and much CLOSER to the brook, would not have the same issue. BP GAS STATION – SOUTH RIVER STREET --- After a contentious hearing that ended a year ago, BP has not broken ground on the triangular Puntasecca contractor’s yard just south of Costco. Time is running out, and they might have to go back to the Planning Board for a re-application. The city had originally sought the land for inclusion in the plan to relocate the County Police and other county facilities to the vicinity. The Puntasecca’s and their friends fought hard to get an approval for the BP, and took their complaints to the County Board of Chosen Freeholders on multiple occasions, forcing the County to back off from the acquisition plan. Now it looks like we’ll be stuck with the contractor yard there. 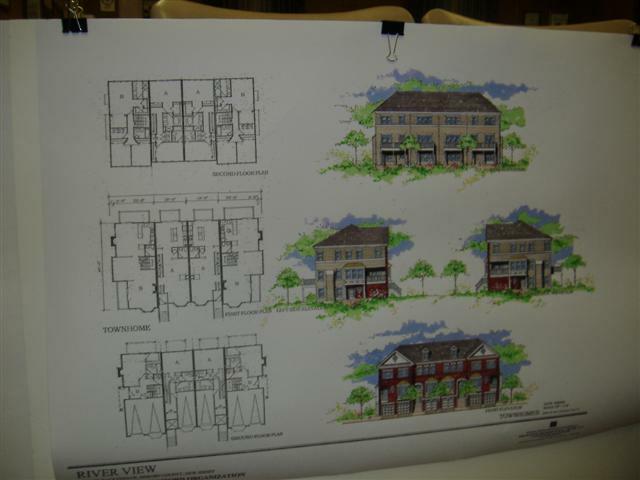 Depiction of a 97-unit luxury townhouse project approved by the Planning Board on May 10, 2006 for the Mazda property on River Street across from Giant Market and the Oritani Field Club. Units prices will vary from $600,000 along the street to $800,000 along the riverwalk. The project's pool and clubhouse will approximately occupy the site where 5 firemen died in the 1988 Ford fire, thus ensuring that no units are themselves built on hallowed ground. This project is equivalent to expanding the border of Hackensack outwards to include 97 high-end single family houses. That can't be done, but we can build them within the city's borders. This ratable will be worth $65-$70 million, and will contribute SEVERAL MILLIONS dollars annually in tax revenues. The developer has deep pockets and is already looking at other properties in Hackensack to build more units. Mazda intends to move to the site currently occupied by the defunct Fuji Photo factory. A surge of luxury townhouse development within the boundaries of the Fairmount Elementary School is expected to have a positive impact on student test scores. In today’s society, there is a very strong correlation between student test scores and socioeconomic factors, specifically the PARENTS highest level of education, household income, and marital status. This is even more true now than it was in the 1930’s or 1950's. Although there are always exceptions, the long term statistical average is undeniable. 147 units of townhouses, all upscale in nature, have either been approved for construction, are under construction, or will break ground soon. These include 24 units at Prospect Ave and Anderson Street (completed and for sale), 9 units at Union and Berry Streets (under construction), 17 units at the Alan Party Rental property on Second, Berry & James Streets (approved in April), and 97 units at the Mazda dealership at River & Berry Streets (approved May 10th). It is logical to assume that the students generated by these units will be of diverse national and ethnic backgrounds, but all from families on the mid to high level of the socioeconomic ladder. On average, they will perform well in class. The bottom line is that good housing stock and good neighborhood conditions in the long run means good schools. The May 8th fire which destroyed the notorious crime-ridden 28-room boarding house at 211 Passaic Street will have a long-term positive positive impact on the whole neighborhood from James Street to the eastern two blocks of Hamilton Place. For decades, potential home buyers have been deterred from moving into the surrounding neighborhood because of the “frightening” conditions at 211 Passaic Street. Literally overnight, property values have soared in that neighborhood. The whole socio-economic profile of the area changed in the blink of an eye, as the lowest 28 units were destroyed. Although those units were not contributing to school enrollment, in the long run a better neighborhood ultimately means a better school. Other multi-unit developments are planned for the Fairmount School District. The current border between the Fairmount and Nellie K. Parker districts in central Hackensack is Clay Street. This border may eventually need to shift northwards a few blocks due to enrollment issues at the Fairmount School. YES, this counts as real estate news. Nothing affects property values more than school performance. Responses to the latest posts by Eric Martindale can be found here. (1) CANCER CENTER -- Despite conventional wisdom to the contrary, it looks to be certain that the Hackensack Zoning Board of Adjustment will DENY a major application by Hackensack University Center. They have reached a major impasse with HUMC over the controversial cancer center and 1000 +/- space parking garage, slated for the north side of Atlantic Street from First Street to the top of the hill. The board wants the Atlantic Street widened to improve traffic flow, and HUMC does not. At the July 13th meeting, the board went out of it’s way to solicit testimony from Fire Chief Joel Thornton. His testimony on traffic flow matters was a devastating blow to the application. HUMC’s lawyers and consultants have lost their typical coc ksure swagger. They pace around with glum looks on their faces, heads slightly turned down. If the street is widened, the project will have to be totally re-engineered, because HUMC is building so close to the streets to begin with. It’s a safe bet that HUMC will either deny the application before the August hearing, or it will sue Hackensack for denying the application on the grounds that it is an inherently beneficial use. (2) The “Tucci hearings” continue for the block bounded by South River Street, Hudson Street, Moonachie Ave, and the Little Ferry border. Tucci and a company he owns hold over 70% of the acreage there, which the city is in the process of declaring an area in need of redevelopment. Tucci is adamantly opposed, even though he would likely be declared the developer and would then have access to the properties he has been unable to secure via the open market. But there’s a chance that someone else will be declared the developer, and he would then lose control of the lands. Exempted from the lots to be declared in need of a “taking” are all the one and two family houses, a tropical fish store, and Tucci’s two office buildings. The 3rd and final hearing will be July 31st, and it’s a guaranteed that the Planning Board will vote in favor of the declaration. In fact, it’s possible that a unanimous vote is in the wings. Tucci wants to build a "Suite-style" hotel of over 100 units, but is also open to condominiums on the property. He and his attorney battled with the board and the board's special redevelopment attorney for hours on July 13th at the Civic Center. (3) The city is working on it’s next major redevelopment project. The two blocks bounded by Main Street, Atlantic Street, Moore Street, and the historic Green. This includes one extremely significant historic structure at the corner of Moore and Washington Street. A report will be compilated documenting the need to redevelop these blocks, and hearings similar to the Tucci hearings will be conducted. Good place for a major mixed use development. If the front setback is increased, there could be some REALLY nice storefront café’s in immediate proximity to the Courthouse and Court Plaza. (4) The city’s BID (Business Improvement District) will be expanded along Main Street south of Mercer Street. (7) The Planning Board approved a 17 unit luxury condo on Myer Street directly across from Union Street Park, and adjacent to a garden apartment. Two really “ghetto” houses containing multiple apartments will be torn down. This is the best thing to ever happen on Myer Street, a gritty mixed use street that used to be a quiet Jewish neighborhood 50 years ago. The Salvation Army at Union and Myer Street is out of money, and their rehab project is seriously in peril. Adjacent to the Salvation Army, on State Street, is another condo plan to replace a glass store. (8 ) A proposal for a parking garage on the SE corner of Beech and First Street, to be built OVER Giovanni’s restaurant, has been withdrawn. (9) 40 units are proposed for the vacant site at 29 First Street, where a concrete foundation has been sitting there for about 20 years. That’s near Essex Street. (10) The city is coming closer to fixing all the problems with the new Zoning Ordinance that was passed in June 2005. They are also looking at revamping the DEFINITION of the two-family zone, to better preserve street parking and reduce the number of older single-family houses that get converted into 2-unit apartment buildings owned by out-of-town investors. (11) The Martin Luther King Jr. Senior Center, which was denied at 375 First Street (near Stanley Place) will be litigating against the city. They sought to knock down a house in a 2-family zone and build 6 units with a community center. The variances sought were extensive, and parking was the biggest issue. In today's Record, (North Jersey Briefs). HACKENSACK -- Several sections of the city will be studied to see if they should be declared areas "in need of redevelopment." Last week, the City Council unanimously passed five resolutions that ask the Planning Board to conduct the studies. "We are making a statement here to see significant change in Hackensack," said Mayor Karen Sasso. Sections of Newman, Sussex, Essex, Atlantic, First and Beech streets will be examined, as well as portions of Main, Passaic, Park, Anderson, Green, Lodi and South Newman. The board will have to determine whether the areas meet at least three of seven state criteria to be designated in need of redevelopment. Once an area receives that designation, the municipality has the authority to revitalize specific properties.